�.According to Reiny Hiss, ACTS is currently buying 80% of the food it distributes. In May and June, ACTS averaged serving 21 families a day. Oconee County Churches have been helping needy families with food and clothing since the early 80’s. They formed Area Churches Together Serving (ACTS) to coordinate the efforts. It is staffed by volunteers. 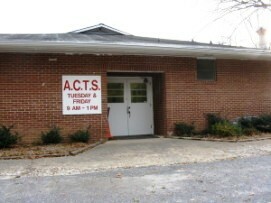 Churches take turns working at the ACTS facility at Bogart. Watkinsville First Methodist Church worked there on Friday, July 27, 2012. Wes Smith, Administrator at WFUMC, filmed the ACTS facility and an interview with the Director, Reiny Hiss. It is an enlightening clip and well worth watching. Reiny describes the food needs and how the numbers of families have dramatically increased in recent years- with the Recession Economy. Can-A-Thons and gifts help provide much food.However, the tremendous need outstrips the donations. According to Reiny Hiss, ACTS is currently buying 80% of the food it distributes. In May and June, ACTS averaged serving 21 families a day.